Humans are social animals, and if the quintessential instrument of communication smells foul, who would like it? 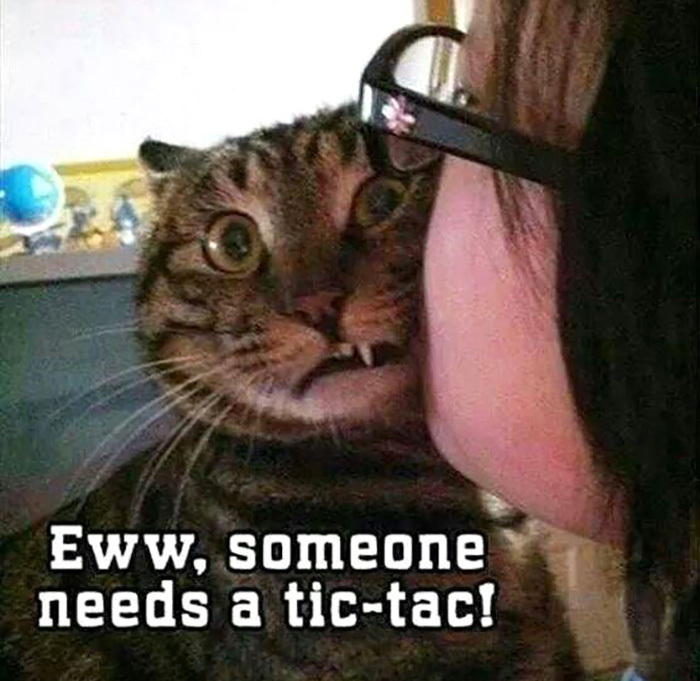 Not this cat, for sure! When Elvis Costello, the world famous English musician said, “Good manners and bad breath will get you nowhere,” he wasn’t kidding about bad breath! Bad breath or halitosis, as it is medically known, affects 1 in 4 people around the world. It is physically repulsive to others and also psychologically affects the person afflicted with it. Don’t despair! Read on to know about the different yoga exercises that can eliminate the problem of bad breath and provide lasting freshness. Stress – People with bad breath are 60% more likely to suffer from stress than non-sufferers. Depression – 57% of sufferers feel depressed because of bad breath. Unattractiveness to others – Studies show that bad breath is one of the top three unattractive factors in a person. Adversely affects interpersonal relationships – Surveys at the workplace reveal that bad breath, along with poor personal hygiene, is the second most bothersome and distressing trait in colleagues. No shortcuts/permanent treatment available – 71% of sufferers have considered painful surgeries to eliminate bad breath, but surgeries are only effective in less than 3% of cases. Symptoms – Are You Suffering From Chronic Bad Breath? Bad odor from the mouth – The best way is to ask another person to smell your breath. Another way of checking this on your own is by scraping the back end of your tongue with a plastic spoon and leaving the residue to dry. If the dried residue smells bad, it is most likely that your breath will also smell bad. Bad breath all through the day – This is the most definitive indicator of chronic bad breath. If your breath smells bad to others throughout the day, even after you cleanse your mouth, then it is a hint that you have to seek a solution to this problem. Causes – What Causes Chronic Bad Breath? Poor Dental Hygiene – Possibly the most common cause of bad breath is a negligent dental hygiene routine. Brushing your teeth, flossing, and gargling your mouth properly with a potent mouthwash are part of a daily practice you must follow. Preferably, every morning and in the evening as well. Food particles stuck in the crevices of your mouth and gaps between your teeth are the breeding place for bacteria, which cause bad odor. People with dentures are especially at risk. One clear indication of insufficient dental hygiene is the build-up of plaque on the teeth. A few more are – bleeding gums, mouth infections, and a layer of white plaque on the tongue. Tobacco Consumption – Smoking and chewing tobacco make your gums more susceptible to diseases that cause a lingering bad odor. Other Health Problems – Infections or diseases of the sinus, throat, respiratory tract, liver, kidneys, and other organs affect your breath. Other conditions such as thrush, diabetes, acidity, lactose intolerance, and metabolic disorders also cause persistent foul odor in the mouth. Medication – Certain medications reduce saliva production. Others break down to release chemicals that contribute to smelly breath. Poor digestion is a major cause of bad breath. Chronic indigestion leads to the putrefaction of food in your stomach, colon or intestines. This causes persistent and stubborn odors to emanate from your mouth. Yoga promises to not just eliminate the symptoms of bad breath, but also to cure the underlying health issues that cause it. In the video, Tara Stiles, founder of Strala Yoga, shows us how to do the basic Sun Salutation routine in a simple step-by-step video. The Sun Salutations or Surya Namaskaras are a power packed beginning to any yoga routine. A complete body workout that focuses on detoxifying the entire body. Adreine shows us how to do the Lion Pose in her expressive step-by-step video. The Lion Pose or Simhasana emulates the fierce lion. It stimulates the alimentary canal and helps in getting rid of respiratory tract infections. This integral exercise is specially effective against bad breath. The video demonstrates the benefits of this exercise and gives a step-by-step guide to do the Matsyasana. The Fish Pose or Matsyasana emulates the beautifully poised flow and structure of a fish. Breathing correctly plays a major role in this pose. It affects the digestive system, throat, and the nutrient absorption process, thus helping in detoxification. It also promotes the correct technique of breathing. The benefits of this exercise and the step-by-step procedure to do the Shoulder Stand Pose safely are demonstrated in this detailed video. The Shoulder Stand Pose or Salamba Sarvangasana is a great pose for improving digestion and stimulating the digestive system. It enhances general body metabolism as well. This video by KinoYoga shows the benefits and step-by-step procedure to do the Paschimottanasana. The Seated Forward Bend Pose or Paschimottanasana is a complete relaxation pose to finish the yoga exercises and routines. By deeply relaxing all organs and expelling negative energy, it cures indigestion and respiratory and stress-related problems. The video above demonstrates the benefits of the pose. Watch our step-by-step guide to learn the Half Plough Pose or Ardha Halasana. The Half Plough Pose or Ardha Halasana remedies the problem of bad breath by curing its causes – digestion and stomach disorders. It also improves blood flow and stimulates the abdominal organs. This improves digestion and expels gas. Together, these effects work to freshen up your breath. Watch the video demonstrating the benefits and the step-by-step guide to learn the Breath of Fire or Kapalabhati Pranayama. The Breath of Fire or Skull Shining Breath is commonly called the Kapalabhati Pranayama. It is a powerful breathing exercise that purifies and expels toxins from the nasal passageways, sinuses, lungs, throat, and respiratory tract. It is one of the best yoga poses for bad breath as it effectively purifies the humors and detoxifies the body and mind. In the video, Adriene demonstrates the benefits and the step-by-step procedure to practice the Cooling Breath or the Sheetali Pranayama. The Cooling Breath or Sheetali Pranayama is another powerful breathing technique. It is designed to cool down the body and relieve anxiety and stress. It clears up the digestive organs, thus promoting better digestion. The Sheetali Pranayama is especially powerful for people suffering from mouth, throat, and tongue diseases, which are often the cause of bad breath. With this exercise, you can fight acidity and reduce gas as well. The video demonstrates the benefits and gives the step-by-step procedure to practice the Corpse Pose or Shavasana. The Corpse Pose or Shavasana is a complete relaxation pose. A perfect finish to all yoga routines, it deeply relaxes all organs and expels negative energy that causes digestion, respiration, and stress-related problems. Apart from the regular practice of these yoga asanas for bad breath, the most important aspect is to back your yoga routine with excellent dental hygiene. Brush and floss your teeth regularly. Use an antiseptic mouthwash after brushing to eliminate any remaining bacteria in your mouth and throat. Do this after every major meal, or at least twice a day. Regularly doing yoga exercises and maintaining strict dental hygiene will give you long-lasting, fresh breath. You can face challenges with absolute confidence and don’t have to shy away from social situations ever again! Remember to follow StyleCraze for more tips and videos on how yoga can drastically change your life. It is the key to a better body, imparts peace of mind and enlightens your soul. Have you ever considered Yoga for bad breath relief? We’d be delighted to know if our routines have worked for you. Do comment and share your experiences below. How To Do Sudarshan Kriya And What Are Its Benefits?